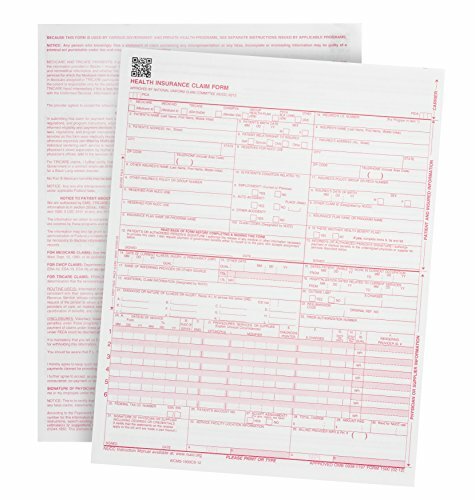 500 CMS-1500 Claim Forms - Current HCFA 02/2012 Version ''New Version''- Forms will line up with billing software and Laser Compatible- 500 Sheets - 8.5'' x 11 by Blue Summit Supplies at High IQ Business Network. MPN: FBA_BSS-92588-302. Hurry! Limited time offer. Offer valid only while supplies last. CMS 1500 Forms that are compliant with all Government Standards CMS 1500 forms that are printed in the USA by US government authorized printers. All forms adhere to strict government standards developed by HIPAA in accordance with American Hospital Association, CMS centers for Medicare and Medicaid Services, NUCC, and NUBC. Thick 20 LB paper allows for easily feeding through laser or inkjet printers without worrying about jamming.